CNN debate ratings: Donald Trump brings in record ratings for Jeff Zucker's network. 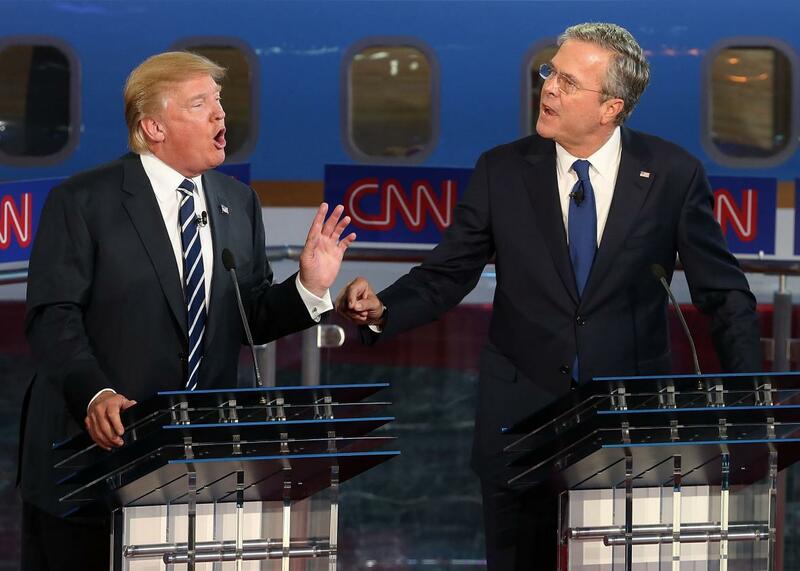 Donald Trump versus Jeb Bush at CNN’s presidential debate. Who wouldn’t want to watch this clash of titans? Wednesday’s record was especially impressive, though, coming not in a primetime one-on-one special, but in what was supposed to be one of about a dozen standard format presidential debates. “These are NFL-level ratings—affirming that the Donald Trump fueled Republican debate slate is one of the most popular television shows of the year,” CNN’s Brian Stelter reported. CNN’s best previous debate audience was a Democratic debate in the midst of the heated primary battle between Hillary Clinton and Barack Obama with an average program viewership of 8.3 million on January 31, 2008, according to Stelter. Even Wednesday’s 6 p.m. “happy hour” debate seemed to benefit from being Trump’s lead-in, with an audience of 6.3 million for the four also-rans. Fox’s opening nationally televised Republican debate averaged 24 million viewers, but Stelter notes that was a shorter debate by nearly an hour. This likely diminished the number of viewers who stayed throughout the entire program for CNN’s debate, and thus the overall viewing average. But it also meant an extra hour of advertising, with only slightly lower average ratings. While it seems inescapable that the rating surge is almost entirely Trump-based, it also seems unlikely that viewers are tuning in to see Trump as a policy wonk—or even as entertainer—as much as they’re tuning into see the fantastic train-wreck that happens whenever the Donald dukes it out with people that are seriously trying to become president and have some realistic chance at it. The ratings for both of the first two debates were roughly double what Trump’s “Celebrity Apprentice” program had in viewership even at the show’s peak, and quadruple what it did during the last season back in February. This would indicate that the appetite isn’t necessarily for Trump the performer, as much as it is for Trump the guy who sarcastically insults Jeb Bush to his face and for whatever fireworks happen next.